Once upon a time, there was a town named Madaba. Then and there, map-making was the vanguard of space-thinking. Figure 1 : A Cartogram of Palestine, in the church of Madaba [Jordan], 6th century AD. Source: Jacques Lévy, 2007. 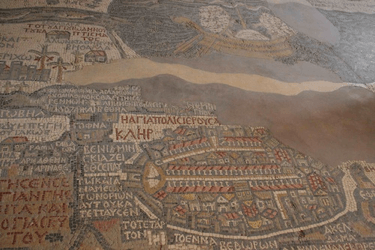 Doing their maps cartographers of Madaba had understood that a map is a chart, a table, a conventional arrangement of data but a language, too, that is to say an open sense-making combination of senseless units. They had understood, too, that the structure of this combination is not independent from but somehow related to what is said thanks to it. After some centuries of hesitation, cartography was progressively driven into a process of mathematization that simultaneously accepted the idea of a cartographic language, but a language tightly hold by a small number of imperious rules: that of a bi-jective projection sphere/plan and that of the Euclidean geometry. When emerging as an academic discipline at the end of the 19th century, geography not only supported this orientation but took advantage of mastering map-making and map-reading to establish its claimed scientificity. Like archive-work for historians or participatory observation for anthropologists, cartography became the official selective technique that guarantee a distinctive epistemic place to geographers. Cartography and geography has thus been coupled and the ‘methodological nationalism’ (Glick Schiller & Wimmer, 2002) that saturated geography at that time contributed to stabilize a block of knowledge articulating a national ideology, a literary bucolic ethnography, and technical device of location and measurement. Used by both military and administrative sectors of the nation-state apparatus, maps were the token geographers could show to demonstrate, as demographers and economists did with statistics, their usefulness in the making of a state-centred approach to cognition. Geography has changed, and the ‘spatial turn’ (Soja, 1989; Lévy, 1999) is currently influencing the overall social sciences. But what about mapping? The hypothesis developed here is that, in spite of a dramatic technical evolution, cartography has largely remained backward. Cartography is still a discipline marked by old, positivist and structuralist stances. Let us see how it would be possible to reconcile the emerging geography with cartography. Cartography after the geographic turn. If we exclude the Kantian view, which belongs to another type of approach, the debate on the philosophical category of space can be summarised by the following table (figure 2). Figure 2 : Four Categories of Space. Source: adapted from Jacques Lévy, 2008. The pivotal moment in the Western philosophy occurred in the 17th and 18th centuries when breakthroughs in physics and astronomy collided with the religious, creationist representations of the universe. Conceptions of space were at stake of furious controversies, namely between Leibniz and Newton. Newton insisted to see empty space as a component of God’s work while Leibniz contended that space was nothing but a series of distance relations between coexisting realities. Space, then, escape the scope of theology. Descartes, adopting a third stance, admitted, with Newton, the created dimension of res extensa, which formed a unique body structured and made measurable by geometrical laws. The Leibnizian approach defines space as a synchronic system of relations between coexisting realities. This means that the non-spatial component of a reality must be addressed in order to explore the spatiality of this reality. In the history of geography and sciences of spaces, the temptation of a search for ‘general laws of space’ coming from physics or geometry has been strong till the positivist turn of the 1950-70s. In cartography, the idea of topographical map as ‘general’ map (in contrast with ‘thematic maps’) has a clear Newtonian inspiration, while the projected geo-referenced grid considered as a universal, unchallengeable base-map is to be related to Cartesian metaphysics. Can we invent a Leibnizian cartography? We can identify five paradigms that have particularly influenced social sciences along the 20th century. This is true, too, for social sciences of spaces like geography, spatial economics, or urban sociology. Figure 3 : Five Paradigms. Source: Jacques Lévy. There is a sixth paradigm that cumulates the advantages of the existing ones, stating that a society is a relevant entity as well as actors, including ‘ordinary’ individuals. This can be called dialogical systemism. It approaches society as a system, but a system whose basic element is human agency (hence the word ‘dialogic’ is used following Edgar Morin’s approach), capable of constructing strategic horizons and of creating intentional interactions that include communication and co-operation, as well as separation and conflict. Human agency is embodied in three different families of realities: actors = operators capable of strategic intentionality; objects = operators constituted of crystallised actions and involved in action systems; and environments = encompassing realities which encompassed realities have influence on. If maps represent the social world, they have to represent their actors. And map-makers have to be aware that mapping is not a revelation but an intentional action carried out by their own selves, i.e. by cartographers. Can we put the actors on maps, put maps on (the account of) actors? Another aspect of the alternative to those five major paradigms is situated in the epistemological field. Instead of opposing realism to constructivism, the consctructivist-realistic paradigm supposes that realism is not attainable by characteristics embedded in the empirical world but is at stake in a partially cumulative historical process of cognition. Simultaneously, this approach takes on the existence of a world of ‘realities’ that exist independently from the observer, but the knowledge of these realities is never transparent to them. It implies a construction, an invention. So maps should not be addressed only as representations: we can also compare maps to other spaces as spaces, not only as representations. Can we address map as invention, map as a space, comparable with other, non-cartographic spaces? What could be a translation into mapping issues of the changes that occurred in epistemology and theory of the inhabited space? The five following examples are aimed at identifying the concrete impacts of these mutations on map-making. Geographic and cartographic scales are not the same concept. Geographic scale is about threshold between place and area. Cartographic scale is a homothetic reduction ratio. 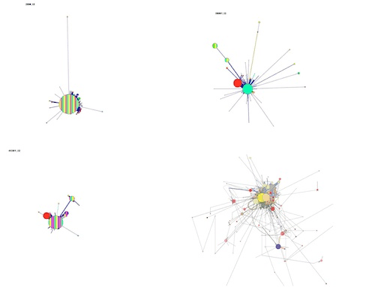 It deals with an efficient relation between a phenomenon and its reduced expression on the map. Certain confusion derives, however, from the absurd contention to consider the two concepts as synonyms, as if the hierarchy of spatial sizes were predetermined by its cartographic representation. The cartographic scale says nothing on the reality represented, but much on the rationale of communication implied in cartographic languages. In both cases the relation to distance is at stake and advancements in conceptualizing distance in geography should be usefully transferred onto cartographers’ control panels. The notion of metrics opens to a large array of relationship to distance: Euclidean/Non-Euclidean. 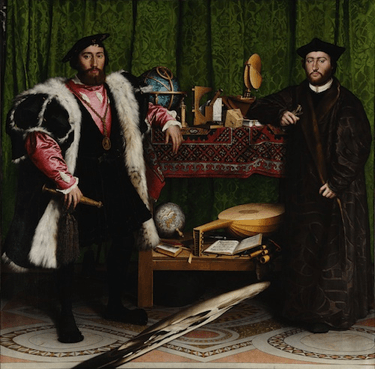 Figure 4 : Hans Holbein, The Ambassadors: An Anamorphous Vanity. Source: National Gallery, Londres. Let us notice that in pictorial art, anamorphosis has been invented soon after perspective, as Hans Holbein’ Ambassadors show as soon as 1533. The long-lasting laziness of cartography in this regard has no historical excuses. 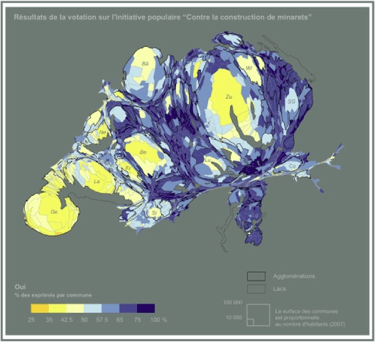 Figure 5 : A Cartogramme: Switzerland: Referendum on Minarets, 29 November 2009. Source: Elsa Chavinier et Jacques Lévy, 2009. Figure 6 : Spatial Metrics. Source: Jacques Lévy. Cartographic metrics are based on the same principle of an infinity of possible distances, but they operate with the heavy constraint of the paper sheet or the computer screen. Mapping metrics can be independent from the referent’s metrics. Territory can be translated into network, and vice versa. On fig. 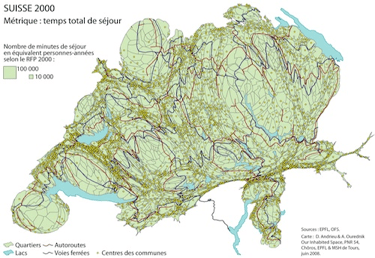 7, a road and railway network has been placed on a territorial cartogramme. On fig. 8, network information (transport accessibility) has been translated into a territorial language. Figure 7 : A Road and Railway Network on a Population Cartogramme. Source: Jacques Lévy, 2009. A place can be defined as a kind of space where distance is considered non relevant. This requires a minimal ‘verticality’ (two ‘things’ in the same location). This raises a problem for classical cartography …a problem that has found some analytic solutions in the GIS approach. What remains non trivial, however, is to find out visual expressions to the thickness of places. We live in multi-layer spaces where the relation between layers is at stake. As said in the previous paragraph, maps, thanks to GIS technologies, make a cartographic translation of this questioning possible. Is this possibility really used? Not enough, I would say. The extension is an abstract of all other spaces we need in order to address a determined space. Extension is a way to bring together and to involve different thematic maps into a communication process. A very similar approach is developed when we try and define the content of a base map. Nonetheless we can create non-base maps (self-extensive maps) see figs. 9 and 10. 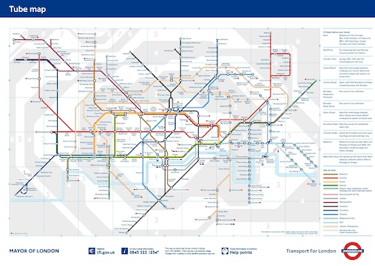 Figure 9 : Map of London Tube. Source: Transport for London, 2012. Conversely, can we imagine an extension-free space? Here cartographic spaces give us an incentive to imagine new ‘actual’, to-be-represented, spaces. Dialogues between cartography and social sciences of space are clearly not one-way. Figure 10 : Maps of individual neighbourhoods. Circles: location and duration of stays. Lines: duration of trips between circles. The fourth image right below is a superposition of several individual maps. Source: Jacques Lévy, 2008b. What if the World were not a volume but a curved surface…? Given we admit that a map is not the reality but a determined cognitive project on a certain reality, the question of the projection can and must be questioned freshly. In many cases, we don’t need it and the question is: by what other application could we replace it to assure a rigorous relationship between the field and the map. Here lies a paradox, as fig. 10 shows. The more we endeavour to give a realistic image of a World made of a complex intermingling of places, territories and networks, the more we see the principle of projection fade and even vanish. 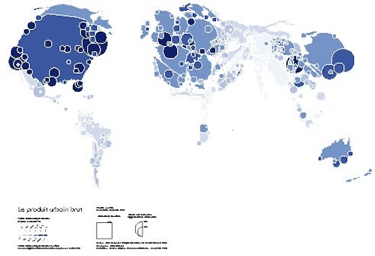 Will we able to adjust our cartography of the globe to the overwhelming reality of globalisation? In brief, cartography would take advantage of more reflexivity on existing innovations and of more openness to new possible sophistications of its languages. This should not be carried out for the mere pleasure of presenting technological novelties, but more seriously, to think through the map, that involve cartography into the scientific debate on the inhabited space. 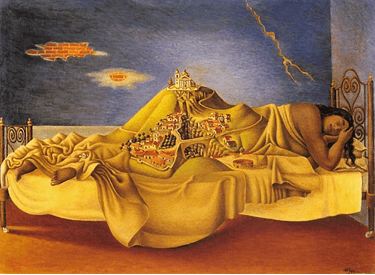 Figure 12 : Antonio Ruiz, El Corzo, El sueño de la Malinche, 1939. Source: colleción particular. And don’t forget: there is not less dream in maps than in the world maps talk about. Brian Berry, Geography of Market Centers and Retail Distribution, Englewood Cliffs, N.J, Prentice Hall, 1967. Manuel Castells, The Urban Question, London, Edward Arnold,  1977. Elsa Chavinier, & Jacques Lévy, ‘Minarets: malaise dans l’alteridentité’, EspacesTemps.net, Dec. 2009. Peter Haggett, Locational Analysis in Human Geography, London, Edward Arnold, 1965. Nina Glick Schiller & Andreas Wimmer, « Methodological Nationalism and Beyond. Nation-State Building, Migration and the Social Sciences », Global Networks, 2-4, 2002, pp. 301-334. Jacques Lévy, Le tournant géographique, Paris, Belin, 1999. Jacques Lévy, ed., L’invention du Monde, Paris, Presses de Sciences Po, 2008a. Jacques Lévy, ed., Échelles de l’habiter, Paris, Puca, 2008b. Jacques Lévy, Our Inhabited Space [research project report], Bern, Swiss National Research Foundation. 2009. Edward Soja, Postmodern Geographies: The Reassertion of Space in Critical Social Theory, London, Verso, 1989. Edward Soja, Thirdspace. Journeys To Los Angeles And Other Real-and-imagined Places, Oxford, Blackwell-Wiley, 1996. Yi-Fu Tuan, Topophilia. A Study of Environmental Perception, Attitudes, and Values, Englewood Cliffs, N.J, Prentice Hall, 1974. 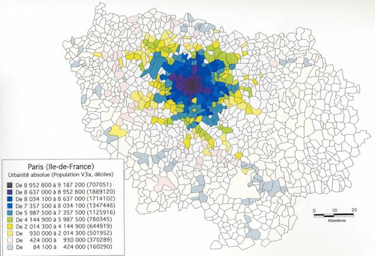 VillEurope (1998)- Métroparis [research project report], Paris, RATP/Pir-Villes. La cartographie moderne, fondée sur la conception euclidienne de l'espace et la mathématisation de son langage a servi de fondement à la géographie universitaire et lui a permis d'accéder au statut de discipline scientifique. Cependant, les développements des dernières décennies et le "tournant géographique" qui s'est manifesté dans les sciences sociales ont changé la discipline, créant un nouveau décalage avec la cartographie, qui apparaît aujourd'hui conservatrice et vieillie, malgré ses perfectionnements technologiques. La réconciliation entre géographie et cartographie suppose de retravailler les appui philosophiques, en se référerant aux concepts d'espace de Leibniz et de Heidegger, afin de faire de la carte une expression d'un systémique dialogique et de la rendre capable de rendre compte des univers relationnels du social.